Victorinox have been making high quality life-long tools for years and thanks to unsurpassed testing standards their line of everyday tools are guaranteed to last every day. This set of stainless steel nail clippers is no different. 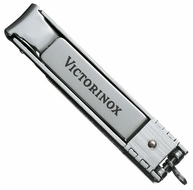 Whether you are trying to bite a nail-biting habit but never have the right tool at hand to do it - or you find your ordinary clippers are just too fragile to stand up to trips about - these Victorinox clippers are for you. This is a genuine Swiss product will not give up when you need it most. The fine European engineering that goes into every set is aimed solely at your complete satisfaction. Now you can cut those pesky hangnails while at the cinema or out about in the middle of a ranch, safe in the knowledge that this finely crafted tool will not give up when you need it most.